Frank. 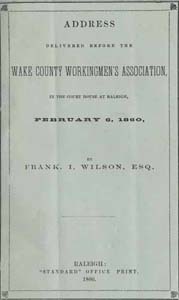 I. Wilson Address Delivered before the Wake County Workingmen's Association: in the Court House at Raleigh, February 6, 1860. Raleigh: Standard Office Print, 1860. Ad valorem tax -- North Carolina -- Wake County. Labor -- North Carolina -- Wake County. North Carolina -- Politics and government -- 1775-1865. Taxation -- North Carolina -- Wake County. Working-men's clubs -- North Carolina -- Wake County.